paul gregutt's washington wine blog – unfined & unfiltered: bored with wine? time to try something new! A 2010 Verduno Pelaverga, hand-carried from the northern reaches of Italy’s Piedmont, was a highlight of my recent vacation on the Big Island of Hawai’i. Verduno is the town, Pelaverga the grape, and the wine’s color, a soft rose, was reminiscent of Pinot Noir, or a very delicate Nebbiolo. Low in alcohol and rich in flavor, it tasted just as good on the second day. A pair of wines from Abbaye Sylva Plana winery, in the village of Laurens in the Faugères region of the Languedoc, offered equally fascinating pleasures. 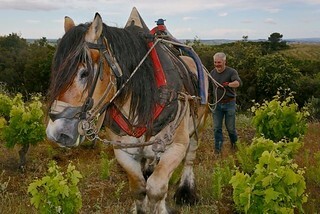 Cédric Guy and Nicolas Bouchard, are two 40-something wine growers who began making wines together about 15 years ago. They farm their best (oldest) vines biodynamically, plow by horse, and use natural treatments and organic compost. Their 54 hectares of vineyard include sections originally planted by Cistercian monks 900 years ago. I tasted a delicious, mineral-soaked 2011 red blend called La Closerale. A classic mix of Syrah, Grenache, Carignan and Mourvèdre, it had the racy minerality and tart, almost steely berry fruit flavors that I love. A brother wine – the 2012 Les Novices, was also built upon a GSM base, but this time with Cinsault instead of Carignan. Deeper, denser, and fruitier, it was beautifully accented with scents of mineral, soil and herb. Faugères was granted AOC (Appellation d’Origine Contrôlée) status in 1982 (for red and rosé wines) and in 2005 for white wines. Soil is mostly schist, the climate Mediterranean, the grapes mostly red. I’ve had only a few wines from the region, but in my mind they represent exceptional value in a style with more finesse and less vavoom than their pricier Rhône neighbors. Part of the Franck’s Signature Wines portfolio, they are represented by Promex Wines. Closer to home, I’ve just tasted another very fine, old vine Washington State Chenin Blanc, this one from Pacific Rim. The 2012 vintage is just out, and sourced from a vineyard planted in 1968. I tell you, these old vine Chenins (I have two with Waitsburg Cellars, and share a vineyard source with Marty Clubb at L’Ecole) are sensational, and really catching on. The Pacific Rim wine is round and floral – it feels downright silky on the tongue. Classic flower and tree fruit flavors compound, with a lick of butterscotch as the wine rolls through the finish. There is just a touch – 1% – of residual sugar. A super value at $10. And one more, from Valley of the Moon Winery, in Glen Ellen, California. I've written and enthused about Oregon Pinot Blanc, but it's been quite awhile since a PB from California crossed my path. This 2012 Sonoma County wine is full and open, with plentiful peach and apple fruit flavors. Rich and round, yet plumped up with acid rather than barrel flavors, it's a lot more interesting than comparably-priced Chardonnays. Suggested retail is $18.